Woot! Here is an awesome deal you can score at CVS! 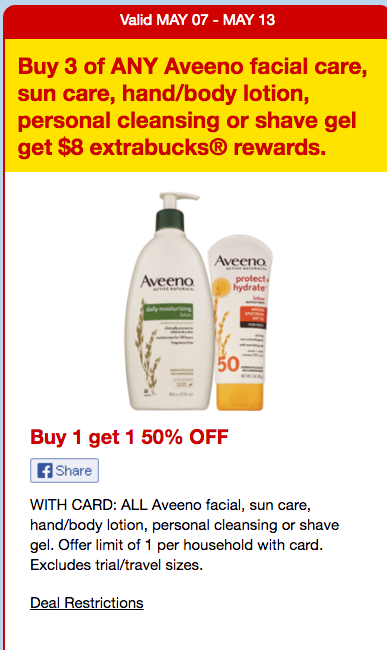 Through 5/13, CVS is offering an $8 ECB when you buy 3 select Aveeno Products, the limit on this offer is 1. The Aveeno Moisturizing Bars regularly priced at $3.79 (price may vary) and they are on sale Buy 1, Get 1 50% off! Many CVS Shoppers are also getting at $2/$6 Bar Soap or Body Wash Purchase Coupon printing from the CVS Coupon machine making it possible to score 3 of these FREE + $3.52 money maker!